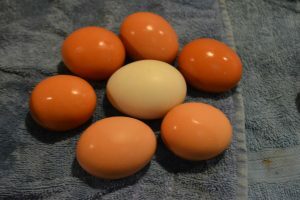 We currently have 2 and 1/2 dozen organic duck eggs for sale. They are $4.00 per dozen. They are at least the size of a jumbo chicken egg. The center egg a duck egg in the midst of our large chicken eggs.